By now you've seen and heard about all the devastation that Hurricane Harvey has done to Houston, as well as the state of Texas. Until now, I had never experienced a hurricane and all the destruction it causes. Since moving here in 2013, I've seen flooding, but never of this magnitude and never with this much continual rain and storms. The storms started last Friday, and have already dumped over three feet of water in Houston. In preparation, we made several trips to the grocery store, got fresh food, frozen food and canned goods. We also bought four cases of water, located and gathered all of our flashlights and candles, and prayed for the best. We hunkered down, knowing it would be a few days before we got to get out. I am happy to tell you that Adam, Safari and I are perfectly fine. We are safe and dry in our home, and have experienced no flooding here, or on the surrounding streets. Luckily, our house is in one of the highest areas in the city. 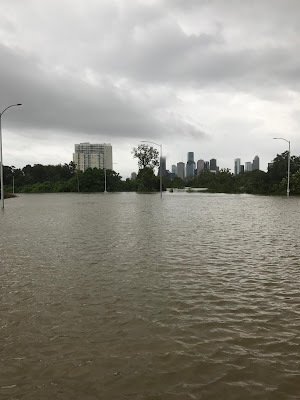 We are right between River Oaks and Montrose, and when we bought it, we did research on flooding to make sure that our area was safe and protected. As we know now, with the unprecedented amounts of rain, areas that have never experienced flooding in the state have been affected. As the storm continues, we are definitely counting our blessings and praying for those displaced from their homes. We lost power briefly Saturday morning, but we're grateful that's the only minor thing that has touched us. We are so thankful to all of our friends and family members that have checked in on us. To be quite honest, the past few days have not only be a learning experience, but have also been stressful and scary. With the weather pattern constantly changing, we've been on high alert, and glued to the tv, watching the news. The images I'm seeing truly break my heart. Although I'm not a native, I've been deeply touched by how selfless my fellow Texans and Houstonians are. I have seen countless rescues on tv, where people have put themselves in harms way to protect the lives of others. Neighbor helping neighbor, and stranger helping stranger - through tragedy, you really are able to see some of the positive in the world. Whether you live in Houston and have been unaffected, or live in another state or even country, there are plenty of ways to get involved and help the state of Texas. As you can imagine, the list can go on forever. These people have lost, or are without everything, so anything makes a world of difference. Go through your closet, pantry, and toiletries, and bring in whatever you can. I brought in everything I could listed above, but also gave them additional items like, Chapstick, slippers, hair ties, makeup, books, magazines - really, anything I could think of. 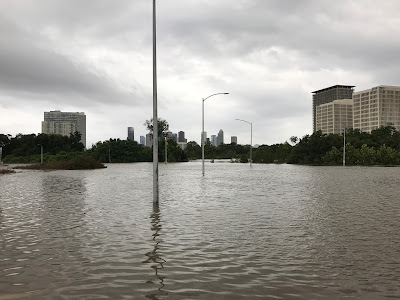 The Houston Food Bank is also collecting donations, and you can click here to see a list of all the emergency shelters in Houston and surrounding areas that need your donations. To donate visit redcross.org, call 1- 800-RED CROSS or text the word HARVEY to 90999 to make a $10 donation. The multimedia giant has set up a donation link directly on iTunes and App Store.Visit www.apple.com for more information. Donations will go directly to the American Red Cross. Houston Mayor Sylvester Turner established this fund administered by the Greater Houston Community Foundation to accept tax-deductible flood-relief donations. Checks and money orders can be mailed to the Greater Houston Community Foundation, while online credit card donations can be made at www.ghcf.org. Online credit card donations will be assessed a small fee by the credit card companies. Donors have the option of increasing their credit card donations to cover this fee. Wire-transferred cash will also be accepted. FEMA, the American Red Cross, and many others are looking for volunteers. If you are safely able to get to any of the shelters as well, they are looking for additional help. I will be updating ways of how you can help daily, so be sure to check back often!! As we continue to take this storm day-by-day, please excuse my brief absence from the blog and social media. Right now, posting "picture perfect" content and photos seems disrespectful and insensitive to the countless people dealing with unbearable loss and heartbreak. Please keep Texas in your thoughts and prayers. God bless you and all those people in Texas. Thank you for sharing ways we can help!